Nakshatra Mala in Hinduism is a necklace made using 27 pearls. The number 27 corresponds to the 27 nakshatras or birth stars in Hindu astrology. Rosaries made using 27 pearls are also referred as Nakshatra Mala. Earlierst references of Nakshatra Mala are found in the Arthashastra, Amarakosha and Harshacharita. Depending on the financial status of the owner, Nakshatra Malas are made using pearls, gems, rudraksha, cowrie, rare stones, bronze, copper, gold and silver. In some cases the pearls and gems are covered using gold. A figure painted in Cave 1 of Ajanta, which is dated to 5th Century BC, wears a Nakshatra Mala. The main benefit of wearing nakshatra mala is that keeps away all kinds of negative energy. There will be peace and prosperity in life. The wearer of the 27 bead mala will have change of luck. It is an ideal solution for those facing financial setbacks. 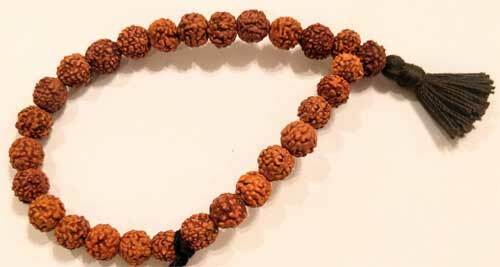 Those having property related problems will find relief after wearing the mala.